CARD'S INSIDE SENTIMENT READS: "I Trust You'll Have A Happy Birthday!" A funny way of greeting someone the happiest birthday! 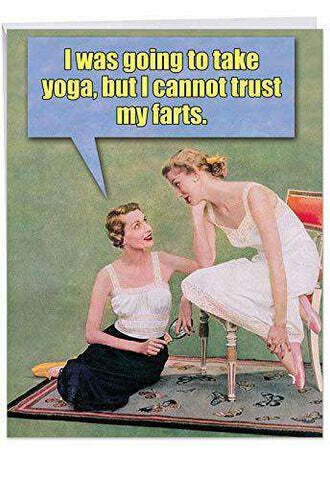 The outside of the card reads, "I Was Going To Take Yoga, But I Cannot Trust My F*rts." This note will surely make your loved one's day! SIZE: Trust in the power of a good f*rt and in this jumbo birthday card that will surely make their laugh worth the trouble! 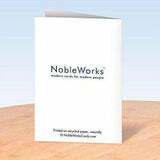 Our big, 8.5 x 11 letterhead size greeting cards can be described as extra-large, giant, huge or oversized that is perfect for such a big decision made. XL font, size, and more to write about what makes this day really special! USE: Never miss this opportunity to gift your loved one this perfect, elegant, uproarious stationery for writing the perfect colossal retirement day message. It ships pre-folded in a protective wrapper with a mailing envelope for your convenience. Be on your extra get-up today and grab one huge birthday day card, or any other occasions, like weddings, father's day, Valentineâs and Christmas, to make your loved one is remembered during this special day! ABOUT THE CARD: Sending huge hugs and love on birthdays. Keeping US jobs at home, our products are proudly Made in the USA for more than 35 years -- not like cheap or off brand Chinese competitors! We print our greeting cards on snow white, think recycled cardstock, made from renewable framed trees. 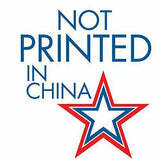 Our Print on Demand technology is eco friendly, reduces waste and minimizes environmental impact.